Hidden within the messaging app is Textopolis, a bustling city where all your favorite emojis live, hoping to be selected by the phone's user. In this world, each emoji has only one facial expression - except for Gene, an exuberant emoji who was born without a filter and is bursting with multiple expressions. Determined to become "normal" like the other emojis, Gene enlists the help of his handy best friend Hi-5 and the famous code breaker emoji Jailbreak. Together, they embark on an epic "app-venture" through the apps on the phone, each its own wild and fun world, to find the Code that will fix Gene. But when a greater danger threatens the phone, the fate of all emojis depends on these three unlikely friends who must save their world before it's deleted forever. Oh, I suppose it's not as bad as all that. After all, if one considers that this was made with the 7-10-year old group in mind, it passes muster. I don't doubt younger kids will enjoy the film for what it is: a relatively mindless cartoon with a few busy action scenes, some pop songs, and a little razzle-dazzle. They're not going to feel any pain. As for the parents accompanying them… The Emoji Movie proves unable to provide even a modicum of content capable of capturing or retaining the attention of an adult. Nap time. At its best, this seems like a second-rate version of Pixar's Inside Out. At its worst, it's a cash-grab based on a cynical high-level concept. 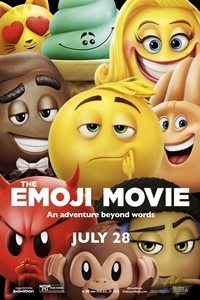 One can envision studio executives deciding to make "an emoji movie" because it would be popular with kids. Based on the eventual storyline, it's likely that the concept came first and the plot (such as it is) was designed around it. There's little evidence of creativity. The animation is slapdash and uninspired, the voice acting is unmemorable, and the sets lack even the rudimentary imagination shown in other "inside the machine" movies like TRON and its sequel. Even with a stunted story, The Emoji Movie should have offered a more interesting visual experience. The movie takes place in two separate realities. In the first, a shy boy named Alex (voice of Jake T. Austin) is trying to connect with a girl he likes, Addie (Tati Gabrielle). Where text messages are concerned, he agonizes over the age-old question: "to send or not to send." When he eventually works up the courage to do it, the one that boldly goes isn't what he expects - it has the wrong emoji! That brings us to the second reality, which is inside the phone. There, we visit the city of Textopolis, where the emojis live. Gene (T.J. Miller) is a "meh" emoji who finds it difficult to maintain a single expression and his control breaks at the wrong time: when Alex uses him. Facing expulsion and possibly deletion, Gene and his friend Hi-5 (James Corden) go in search of the codebreaking emoji Jailbreak (Anna Faris) so she can "fix" Gene. Needing to escape to the cloud, the three are chased around the innards of the phone-world by Anti-Virus Bots determined to eliminate them. The Emoji Movie clumsily references various smartphone games and apps in what amounts to glorified commercial promotion. A "Candy Crush" scene, for example, is a focal point of The Emoji Movie's trailer, forming an ad within an ad. Most of the voice acting is adequate although not memorable. Incredibly, Patrick Stewart was somehow persuaded to provide the voice of "Poop" - I'd love to hear the story of how that came about. The movie offers an unsubtle message about, as Ethel Merman sang, "I've gotta be me!" It also references female stereotyping in the original emoji world. (Didn't know that was an issue.) One line got a chuckle from me: after encountering some emoticons, Gene comments that it's necessary to be respectful to old people. Two years ago, when I reviewed Inside Out, I wrote the following about the animation style: "The 'inside' material has a fantastical, almost hand-drawn appearance - a shimmery, cartoonish look…" Would that something similar could be said about The Emoji Movie, but it opts instead for a cheaper, simpler look that isn't going to awe or amaze anyone. Kids, weaned on TV and Netflix cartoons, aren't going to notice because they're used to lifeless backdrops, but that's the problem. The Emoji Movie looks and feels like something made for Cartoon Network or Amazon Prime rather than a big-screen offering. "Meh" seems almost entirely too kind.